Businessman Mike Zaltsman, owner of the Moscow Black Storm, says that Russia is no scarier than the NFL. Tim Tebow will face a “rough” time if he decides to accept the $1 million for two games on offer for him in Russia but it could resurrect his career, the businessman offering him one of football’s biggest paydays has told RBTH. The deal on offer from Mike Zaltsman, owner of the Moscow Black Storm, offers more than Tebow had in base salary with the New England Patriots before he was cut last month. However, detractors point out Tebow would risk injuries and loss of credibility from playing in the largely amateur Russian league, which would inevitably be seen as a gimmick. Zaltsman has said he has spoken to Tebow and the player “said that the opportunity is very interesting and he'll give it a big thought” but that the star’s agents are against a move to the “very rough” Russian league. Luckily for the Black Storm, there is a joker in the pack – ex-University of Central Florida quarterback Kyle Israel, who Zaltsman says is the point man for negotiations. To the Russian businessman, Tebow is a diamond in the rough. Zaltsman has compared him to Johnny Unitas, who was cut by the Pittsburgh Steelers before going on to become one of the greatest players in history. Success in Moscow will propel Tebow to new heights, his would-be benefactor believes. “It's a great chance for Tim to show everyone that he can be a real leader if his teammates will believe in his ability to lead the team,” he said. Zaltsman portrays the issue in black and white - he is the visionary able to spot Tebow’s talent and the NFL’s experts are merely naysayers, unwilling to take a risk on his hero. 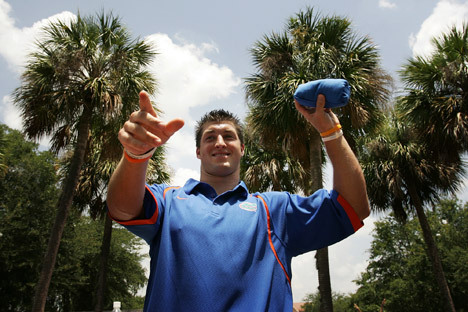 However, even he must admit Tebow’s limits as a quarterback. Like a Russian version of Patriots owner Robert Kraft, Zaltsman is an institution in the small world of Russian football. His money has transformed the sport, allowing the first televised games and renting soccer venues capable of holding more than a few hundred fans. One achievement remains out of reach so far, though. The Black Storm is 0-7 in Russian championship games, a statistic Tebow would be under pressure to correct. If Tebow decides to make the leap into the unknown, his first game would be a Russian championship semifinal between the Black Storm and the Moscow Patriots on Sept. 28. While near-certain to beat the Russian league’s record attendance of 2,000, the crowd would be miniscule by NFL – or even perhaps AFL - standards. Playing the game at the dilapidated Eduard Streltsov Stadium in Moscow is a step forward for the sport in Russia, but the arena’s capacity is below 13,500. As well as a team owner, Zaltsman is a booster for the league, and some of his claims will raise eyebrows in America. “In the U.S. people don't know about our league, but we have 18 great teams in our league and if our best teams will play against NFL teams, I'm sure we can win more than 20 percent of the games,” he said. That claim is unlikely ever to be put to the test – the prospect of the Moscow Black Storm ever suiting up against any of Tebow’s former employers, let alone beating them, is remote. Still, if Zaltsman gets his way, come Sept. 28 there could be a lot of U.S. football fans watching something they thought they’d never see – Tim Tebow tearing up Moscow. James Ellingworth is a Moscow-based sports writer.